Andy Roddick has withdrawn from next week’s Madrid Open and is doubtful for Roland Garros. Tournament organisers have announced that the former world number one has a hamstring injury and has also pulled out for the Rome Masters later this month. Given the Italian tournament starts less than a fortnight before the French Open is due to get under way, the American is facing a race against time to be fit enough to compete in Paris. The three-time Wimbledon runner-up is likely to be more concerned about regaining full fitness in time for the grasscourt season as he has rarely impressed on the clay, his big serve being nullified by the slow surface. Roddick’s compatriot Mardy Fish has also withdrawn from the Madrid event. The pair will be replaced by Dutchman Robin Haase and Olivier Rochus, of Belgium, in the main draw which starts on Sunday. Defending champion Novak Djokovic, Rafael Nadal, Roger Federer and Briton Andy Murray are all due to compete on the new blue clay surface at the Caja Magica. 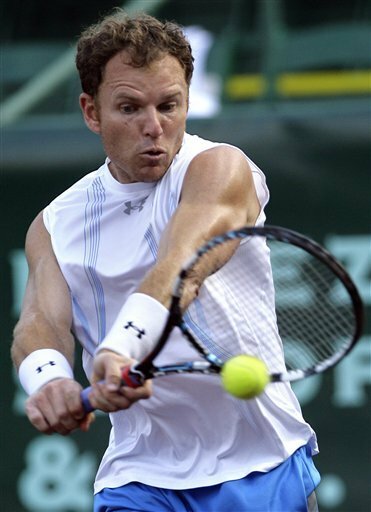 Mardy Fish is ousted by qualifier Michael Russel 6-3,6-1. Michael Russell recorded the biggest win of his career as the qualifier beat top seed Mardy Fish 6-3 6-1 in the last 16 of the US Men’s Clay Court Championship. The 33-year-old, who lives in Houston, was dominant in every department, winning 70 per cent of points on first serve and breaking his compatriot five times to claim his first-ever win over a top-10 player. He will now face fellow American Ryan Harrison after the teenager beat Russia’s Igor Kunitsyn 6-2 6-4. Second seed John Isner avoided an upset by battling back to secure a 6-7 (3/7) 6-4 6-2 win over Horacio Zeballos. That sent Isner through to an all-American quarter-final against defending champion Ryan Sweeting, who beat compatriot Bobby Reynolds 6-3 6-2. Fourth seed Juan Monaco is through after a routine 6-3 6-3 win over Tatsuma Ito, however fifth-ranked Kevin Anderson had to dig deep before overcoming Sam Querrey 7-6 (7-3) 3-6 7-6 (7-2). Mardy Fish is ousted by Aussie qualifier Matthew Ebden. If the Americans think Ebden has it in for their countrymen – he beat American Rajeev Ram in qualifying before his defeat of US No.1 Fish – they can rest assured that’s not the case, with the Australian pairing with young American Ryan Harrison in the doubles event. Harrison joined Ebden in the fourth round of the singles draw following a straight-set defeat of Spaniard Guillermo Garcia-Lopez late on Monday night. “Me and Ryan are really good friends – we’ve become close in the last year or so – sort of like brothers out there,” Ebden said. “We’re playing doubles together and we had a lot of fun playing out on Centre Court. I hope the Americans and Australians get on well. We’re both English speaking and try to take on the Europeans. If we can remain friends and help each other along then it’s good fun.” The pair take on Polish duo Mariusz Fyrstenberg and Marcin Matkowski in a second round match on Tuesday while enjoying a day off from singles play. 7 out of 8 top seeds advance to the quarters in Dubai……Mardy Fish doesn’t! Third seed Andy Murray had few problems dispatching Swiss qualifier Marco Chiudinelli 6-3 6-4. Murray did not face a single break point in the match and broke his opponent twice to ensure a routine progression. Murray’s next opponent, Czech fifth seed Tomas Berdych, enjoyed an even more comfortable run to the last eight with a 6-1 6-2 win over Slovakia’s Lukas Lacko in just 69 minutes. The final quarter-final will be between in-form Juan Martin Del Potro, who beat qualifier Andrey Golubev 6-4 6-2, and Jo-Wilfried Tsonga, who was a 6-3 6-4 winner over Lukas Rosol of the Czech Republic. Mardy Fish loses in Marseille to the #388 player! World number 388 Albano Olivetti pulled off a stunning upset to defeat world number eight and second seed Mardy Fish and reach the quarter-finals of the Open 13 in Marseille. The Frenchman, who won three qualifying matches and then beat the top 100-ranked Matthias Bachinger to reach round two, claimed a 6-3 3-6 6-3 win over the American in one hour and 48 minutes. Fish had been handed a first-round bye on account of his seeding, but was left reeling by the big-serving Olivetti, who delighted the home fans by breezing through the first set without a single break point going against him. Fish rallied to force a decider, but Olivetti refused to be affected by nerves, saving both the break points on his serve and constantly threatening the Fish serve before grabbing the crucial break he needed for a famous win. Olivetti will play fellow Frenchman Michael Llodra in the last eight after Llodra, winner here in 2010, scored a minor shock of his own with a 6-4 5-7 7-6 (7-5) win over Ukrainian sixth seed Alexandr Dolgopolov Jr.
Fifth seed Richard Gasquet made it a great day for France by beating Igor Kunitsyn 6-3 6-2, while fourth seed Juan Martin Del Potro was level 6-7 (8-6) 6-4 with Nikolay Davydenko when the Russian was forced to retire injured. Now we know why Federer never plays in the Davis Cup!…..he’s just not a team player. One of the biggest shocks in recent Davis Cup history was completed on Saturday afternoon when the US doubles team of Mike Bryan and Mardy Fish beat Roger Federer and Stanislas Wawrinka in four sets to see the Americans through to April’s quarterfinals. The reverberations from John Isner’s stunning win over Federer on Friday night carried through to the doubles, which followed a very similar pattern to the Isner-Federer singles. The Swiss won the opening set and looked reasonably comfortable for a set and a half, but once the Americans had broken, the balance of power shifted, and Federer in particular fell away at the end as the US pair won 46 63 63 63 in 2 hours 18 minutes. Because so much was made of Federer’s return to the Davis Cup first round for the first time in eight years, it’s easy to see this result as a disaster for the Swiss. A disappointment it certainly is, but to view it as a disaster would be to take too much credit away from an American team that seems finally to have lost its fear of away clay. Americans Querrey & Fish stumble at the 2012 Aussie Open. Mardy Fish became the highest men’s seed to fall so far at the Australian Open when he was upset by Alejandro Falla on Wednesday. The eighth-seeded American produced an error-strewn display as he went down 7-6 (7/4) 6-3 7-6 (8/6). Having lost the first set on a tie-break, Fish became distracted by Falla’s use of the trainer – controversially it looked like the treatment was for cramps – and a solitary break handed the world number 71 a two-set lead. Fish rallied in the third, coming from a break down to force a tie-break he simply had to win. However, it was Falla, best known previously for blowing a two-set lead against Roger Federer at Wimbledon in 2010, who made the running in the breaker. He blew his first two match points – the first with a nervy double fault – but when a third chance arrived Fish sent a backhand volley wide to give the Colombian a fine win. Fish admitted afterwards he “didn’t play great”. Bernard Tomic delighted the home fans at the Australian Open on Wednesday with victory over Sam Querrey. In what was always a closely-contested match, the Aussie number one emerged a 3-6 6-3 7-6 (7/3) 6-3 victor under the lights of the Rod Laver Arena. Things did not start well for the home hope as Querrey won the only break point of the first set to claim it in just 24 minutes. Seven of Querrey’s 22 aces came in that opening set, but having had a good look at his booming serve, Tomic began to get a read on it. He hit back by taking the second, breaking serve twice, but the match hinged on the third-set tie-break. Tomic palyed some sparkling stuff in it to move ahead for the first time and as Querrey’s errors mounted so did his challenge. An error-strewn eighth game in the fourth set cost him dearly and he handed it away with a double fault when break point down. Tomic duly served out and he will now face another of the ATP’s rising stars, Alexandr Dolgopolov, in the last 32. Bernard Tomic claimed his first title with a 6-4 3-6 7-5 victory over Mardy Fish in the final of the Kooyong Classic. The Australian teenager, who reached the semi-finals in the Brisbane International last week before going down to eventual champion Andy Murray, claimed the first set comfortably after racing out to a 4-0 lead. Although Fish rallied to level, the 19-year-old held his nerve in the decider, breaking in the last game; he sealed victory on the first of two match points. “I’ve never lifted a trophy before at this level,” said Tomicm after his triumph at what is technically an exhibition event. “I’m proud to have my name on a trophy like this. “It’s a good feeling and one that I’ll always treasure. Hopefully this will help me do well at the Australian Open.” Tomic’s success makes him the youngest player to ever win the event. It is also the perfect preparation for the start of the Australian Open, where he will meet experienced Spaniard Fernando Verdasco in the first round. “I want to do as well as I can at the Open. There’s a lot of pressure. but maybe once – perhaps not this year – I can win that title,” he added. Meanwhile, Austria’s Jurgen Melzer claimed third place in the tournament with a 6-3 6-7 (10/12) 6-2 win over Frenchman Gael Monfils. Nadal squeaks by Mardy Fish in a 3rd set tiebreaker. 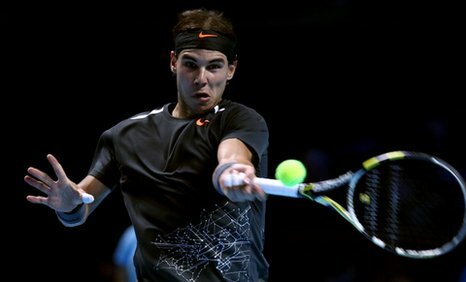 Rafael Nadal survived a stern examination of his title credentials to edge out the brilliant Mardy Fish in a late-night classic at the ATP World Tour Finals. Nadal had not played a competitive match since 13 October and it was all-too apparent as eighth seed Fish fought back from losing the first set to threaten a massive upset. The crowd at London’s O2 Arena were treated to a titanic decider as the clock ticked and both men gave absolutely everything to secure an opening-day win. Nadal eventually emerged triumphant at 2329 GMT, winning 6-2 3-6 7-6 (7-3) in two hours and 53 minutes of enthralling competition. Tomas Berdych, Jo-Wilfried Tsonga and Mardy Fish have all qualified for the ATP World Tour Finals. All three players earned their spots for the tournament in London after Berdych beat Janko Tipsarevic of Serbia 7-5, 6-4 Thursday in the third round of the Paris Masters. Tipsarevic needed to win the title in Paris to qualify for the season-ending event, which starts on Nov. 20. Novak Djokovic, Rafael Nadal, Roger Federer, Andy Murray and David Ferrer have already qualified for the tournament for the top eight players in the world.